So America wants Elizabeth Warren for VP? So the news media is now reporting that America wants Hillary Clinton to select Elizabeth Warren as her running mate. This, somehow, will save her bid for the Presidency, according to the talking heads. According to a Quinnipiac poll, roughly 61% of Americans think Hillary is a liar- especially when it comes to issues like her husband’s dalliances with multiple women; her response to the loss of American lives in Benghazi (we’ll get that movie producer if it’s the last thing we do! ); and her felonious use of a personal server and email while Secretary of State (well, it would be a felony for anyone other than Hillary). So, who better than Elizabeth Warren, known locally as Liawatha. 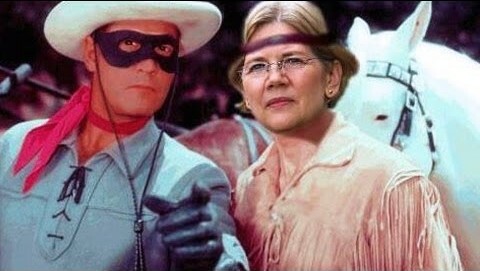 What, you folks in other states haven’t heard of Mrs. Warren’s exploits in her bid for tenure at an Ivy League school? Well, it seems Elizabeth Warren just wasn’t making the cut as a professor at a “regular” school, so she decided perhaps if she checked the box indicating, you know, that she is now suddenly, somehow Native American, why maybe her luck would improve. And what do you know- first a position at Penn, then on to Harvard, where she achieved tenure and was making $350,000 per year teaching one class per semester before her ascension, I mean, election to US Senator from Massachusetts. Of course, I suppose it didn’t hurt that she added her old family recipes to a Harvard publication called Pow Wow Chow, a Native American Cookbook in 1984. Oh, wait, she copied those from the New York Times, so I guess all she has left are those high cheek bones. America – you get what you vote for. Time to wise up and choose right! Born and raised in the People's Republic of Massachusetts, Dave is one of a handful of conservative Republicans still left in the Northeast. Husband to a wonderful wife and Mom, father of an amazing son, Dave works hard to build his sales empire while always engaging others to talk politics, actually think, and try to make America once again the shining light on the hill it once was so many years ago. American Socialists are Scamming the Country!Islam and Communism: Political Doctrines out to Destroy America!